Rest for at least 30 min. Roll into about 8cm circles. First, dice the Chinese cabbage into 1cm pieces (err on the smaller side if you aren't sure), a touch smaller if you want to make dainty dumplings. Place into the largest bowl you have. Liberally salt the cabbage, mixing it with your fingers, till you can feel that each piece has some salt on it. Leave for about 45 minutes, adjusting the time (longer or quicker) depending on the size of the cabbage dice (larger or smaller). After the cabbage is pickled – you’ll know by washing the salt off a piece and tasting it: it should be nicely salted and still retain some crunch – fill the bowl with water and use your hands to give it a bit of a rinse. Drain the cabbage through a colander and squeeze out the liquid. Repeat this process three or four times, till all the excess salt is washed off. Squeeze out all the excess water out of the cabbage, and place back into a clean bowl. Add the rest of the ingredients and mix through. Leave to marinate for 30 minutes. Add a heaped teaspoonful of the mixture in the middle of the wrappers, and wet the edges of the wrapper with a bit of water if needed. Pinch to close in any way you'd like! Just make sure that there are no leaking bits. If boiling, drop the dumplings into boiling water, and remove when they float. If frying, lay the dumplings out into a deep sided pan in a single layer with a touch of oil. Once they start to brown, pour over hot, recently boiled water until the water comes up to 3/4 the height of the dumplings. Cover, and turn heat down to medium. Cook until the water has evaporated and the bottoms are golden and crispy. Serve with black vinegar and julienned ginger. 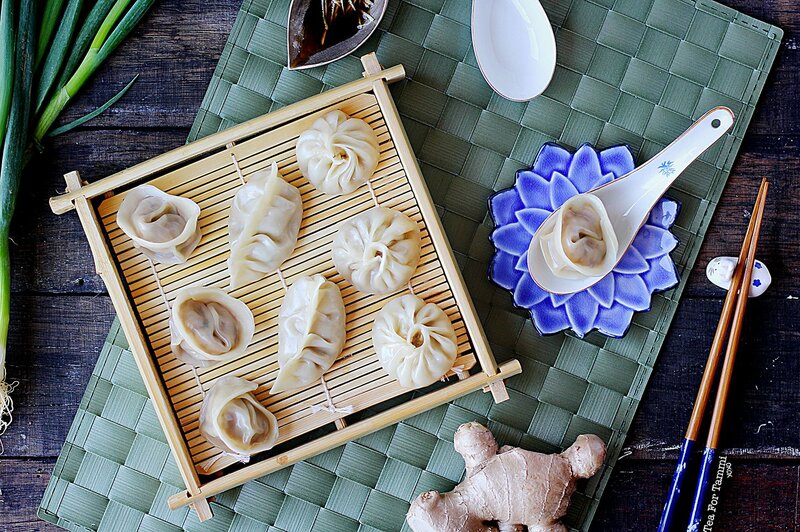 *These dumplings are freezer friendly, and are perfect for a quick meal because they can be cooked from frozen! But wait, there’s more! I’d love to see your best dumpling and what you thought of the recipe! Take a photo and remember to tag @TeaForTammi or Wusthof Australia on Instagram, Twitter and Facebook, and we’ll share our favourites! I’ll be Periscoping every week, so don’t worry if you’ve arrived here fashionably late to the party. Simply join us 6:30pm (Sydney time) every Wednesday for more delicious food, and follow @TeaForTammi to get notified when I go live!